"We are not protesters, we are protectors of the water." "Prayer is more powerful than any man-made law...Mother earth is calling out to all of us who can pray." In the last few days the country received the news that the Obama administration has put a stop to the construction of the Dakota pipeline, and will seek alternative routes that do not invade the sacred Sioux lands or threaten their water supply. Many see this as a victory for the tribes who stood their ground. A victory it is, but a victory of far greater significance than the rerouting of a pipeline. Far more was taking place at Standing Rock than what appeared to be the story. 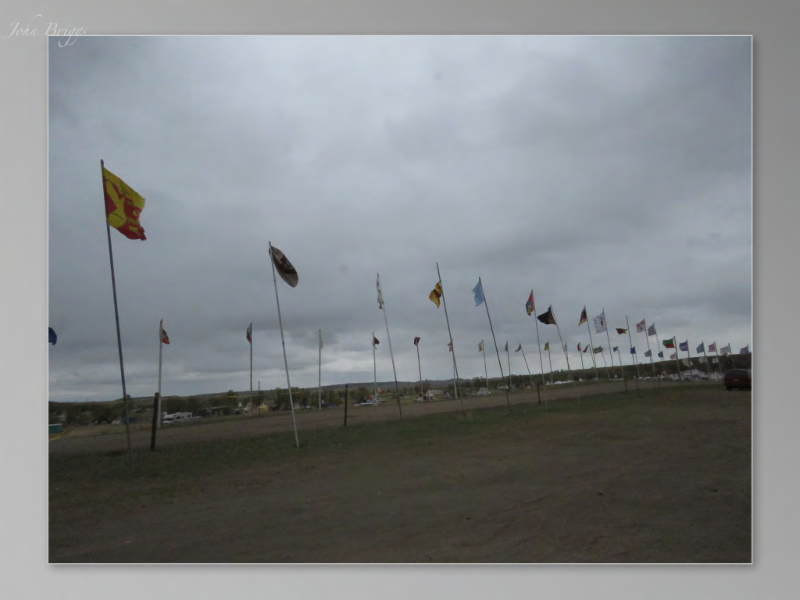 What follows are excerpts from a report by John Briggs, who along with another member of the Contemplative Alliance, Robert Toth, joined Tiokasin Ghosthorse and visited Standing Rock. Robert Toth, John Briggs, and Tiokasin Ghosthorse traveled October 5-11 to the Standing Rock Reservation in North Dakota. 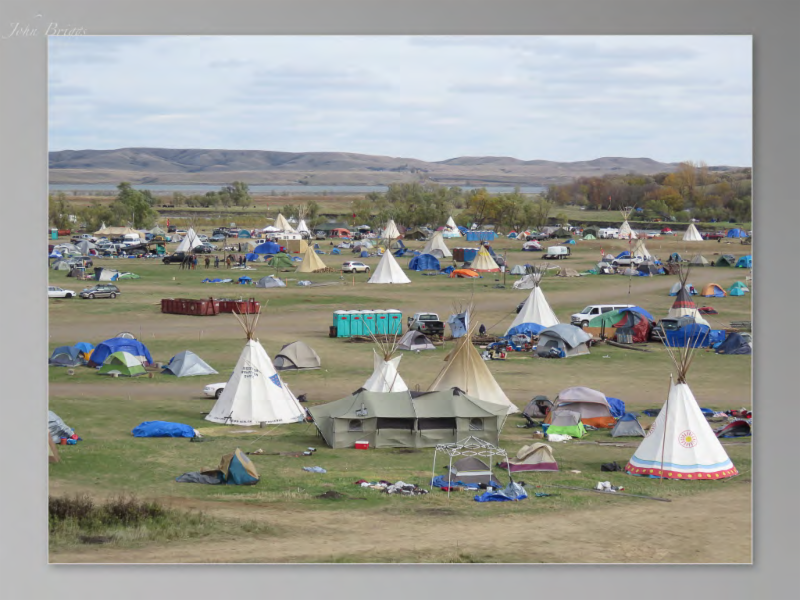 Since the spring of 2016 members of over 300 tribes from the US and around the world have come to Standing Rock as “Water Protectors” to stop a crude oil pipeline slated to run beneath the Missouri River immediately upstream of several Sioux reservations. 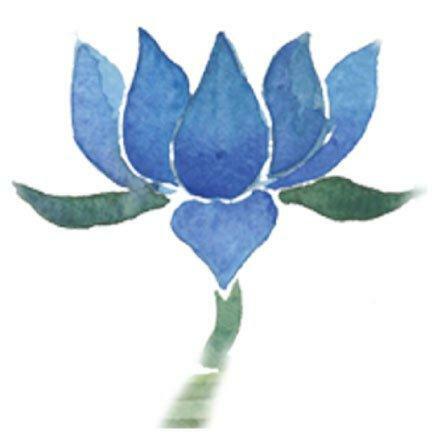 The three travelers represented the Contemplative Alliance, an inter-spiritual movement based on the premise that inner spiritual work can change the course of things and significantly impact the external world. This belief was in clear evidence at Standing Rock where for many months thousands engaged in prayer, meditation and sacred ceremonies around the clock in order to protect the sacred lands and waterways. Indeed it was this prayer energy and Mother Earth’s response that led to the successful retreat of the Dakota pipeline. The Lakota word for “white man” is Wasi’chu (Wa SHE choo). Wasi’chu means literally, “takes too much.” Early in our visit to Standing Rock, our colleague, Tiokasin Ghosthorse, tells us the Wasi’chu story. He says that at a time when the Europeans arrived, a starving immigrant showed up in a Lakota camp. Nutrient rich tallow fat from the sacred buffalo was drying on racks in the sun. Without asking, the man seized and consumed all the tallow that he saw hanging there. Tiokasin tells us, “He didn’t leave any for anyone else. The Lakota had never observed that behavior before.” So the Lakota word for “white man” describes this takes-too-much behavior and attitude--a manifestation of his thought process--not his skin color. The term Wasi’chu applies to any non-native. The “takes too much” behavior of the Wasi’chu encapsulates metaphorically what the Standing Rock movement to stop the Dakota Access Pipeline (DAPL) is about. As the indigenous peoples of North America come together and pray--creating an historic movement to prevent Wasi’chu’s latest desecration of nature--they illuminate a profound difference between the everyday holistic consciousness that has guided indigenous peoples since Paleolithic times, and the everyday aggressively anthropocentric (human-centered) consciousness that has led to our contemporary world. 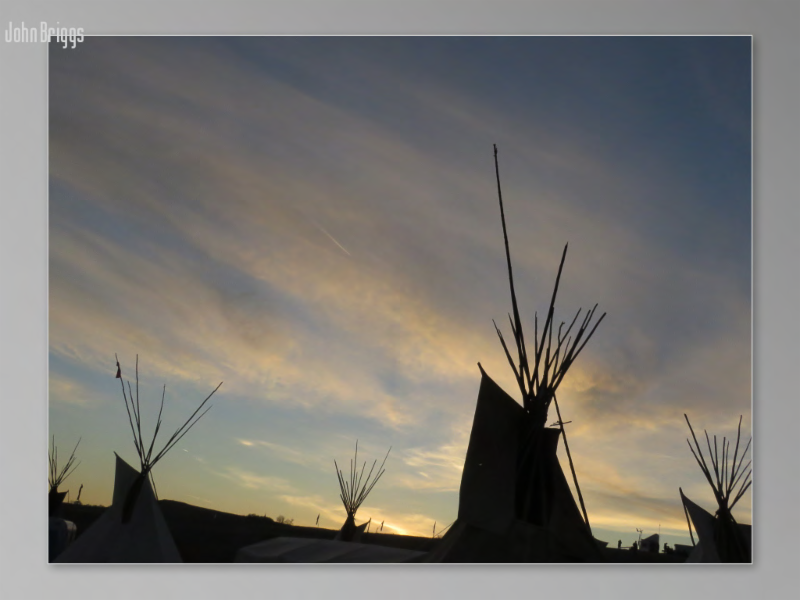 The visit to Standing Rock that Bob, Tiokasin, and myself made for five days in early October 2016, provided us with an unsettling glimpse into the mirror that the first peoples have been holding up to us since first contact. That mirror provided an enlightening perspective on how indigenous peoples view our Wasi’chu consciousness. $ 3.8 billion line intended to carry toxic shale sands crude oil underneath the Missouri River just north of the Standing Rock reservation. We learn from Tiokasin that in the Lakota’s earth-mind way of thinking (and experiencing), water is a living being. Beings, Tiokasin says, “are not objective or subjective,” whether the Lakota are talking about the beings we call animals, plants, rocks, or water. Mother Earth is not made of things but of beings. The being of water is the First Consciousness of Mother Earth. This First Consciousness means “the awareness of the movement that sustains life.” Water provides a “shining mirror to the universe, its transparency offers a model and a path to creation.” Water, Mni, he says can be translated as “that which carries the feeling between you and me” --and the “you” and “me”--and the “you” and “me” are not just humans: trees, sky, wind. Mni also translates as “mother’s milk” or a “mother’s breast.” This is earth-mind thinking. The Lakota are calling attention to water in a way that makes you feel water as you and as your connection to Mother Earth. The brief meeting with Starkey [Lakota elder] alerts us to a truth that will become abundantly clear as the week wears on: What the first peoples bring to this moment in history is a spiritual awareness of the earth that indigenous cultures (including about 500 extant tribes in the US alone) have kept vibrantly alive for 10,000-20,000 years and that has no parallel in the consciousness of the dominant anthropocentric society. The earth-mind is a spirituality of reciprocity and obligation to the natural world in all its manifestations--a spirituality of intimate, holistic relationship with other beings. Mitakuye Oyasin [literally, “my relatives you all are”] is the central expression of this spirituality: we are all related, all beings, animate and inanimate, are related. Linda Black Elk (Catawba Nation) is an ethnobotanist, restoration ecologist and instructor at Sitting Bull College in Fort Yates, North Dakota, on the Standing Rock Reservation. She has been present at the movement since its start on April 1, 2016 on Ladonna’s property. “Over and over, people come to the camp and then they leave camp and they say to me that they miss it. My soul wants to be there. Because it’s so positive. I think a big part of it is unity. “We are seeing the tribes---and not just the native people, our allies---coming together. It’s just so beautiful to witness. Because we are the peaceful revolution. We are working to heal all these past wounds of mother earth, also of ourselves, our souls. She says, “The other day there were folks from a country near southern Africa and they were playing their drums. It’s not just Lakota drums, it’s drums from all over the world that are coming and singing and praying for the planet. This is the center of the universe right now." Prayer -- ceremony and ritual -- is communitarian. When there is a disturbance in the balance, when Earth is traumatized and grieving, her Spirit calls out to all beings to pray with her, and those who pray hear her and come, bringing their spirit to the place of her pain. Their presence is their prayer and the connection of their spirit to the spirit of the place, and all who are present there makes it difficult to leave it until balance is restored. That is the calling of the Natives gathered at Standing Rock. The prayerful response at Standing Rock confronts the destructive spirit driving the construction of the pipeline to bring it back into balance. Until the spiritual balance is restored, the physical destruction continues. When we hear Indigenous people say that they are standing at Standing Rock “to protect the water” we think of their heroic action as one opposing the modern day consumer culture and protecting a fundamental environmental resource. But the truth is they are protecting something more fundamental than that. They are protecting the spirit of earth, which includes the human spirit. They're doing their jobs as humans.